Barbara Helynn Heard, LMT, of Olympia, Washington practices and teaches clinically focused, spiritually grounded lomilomi from the Big Island as well as full chest and breast massage integrated into full body massage sessions. She began doing massage as a teenager in the 1970’s and two decades later, in 1996, graduated from Brian Utting School of Massage in Seattle, WA. She has practiced lomilomi, including chest/breast massage, since then and has taught lomilomi since 2005 and chest & breast massage since 2016. Barbara Helynn maintains an active private practice in Olympia called Awareness Massage. 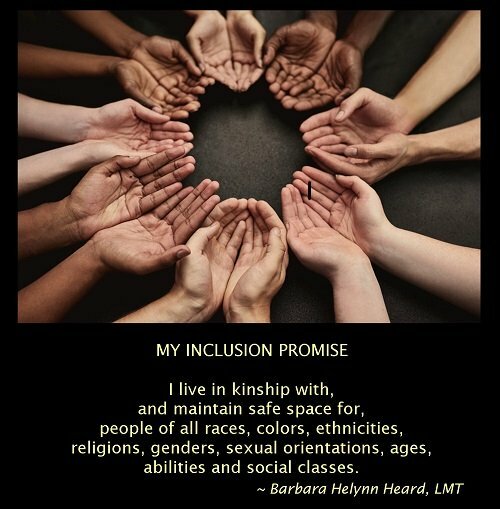 Barbara Helynn blends treatment and wellness focused massage in full body sessions with intent to allow the receiver to experience their own innate goodness in body, mind and soul. Her special focus is on helping folks move freely and easily. With touch that is deep yet gentle, her massage is clinically effective and also feels wonderful to receive. Barbara Helynn is an active massage community leader working to normalize the practice of integrating full chest & breast massage.in full body massage sessions for clients who choose this option. My name, Barbara Helynn Heard, reflects who I am. The name Barbara was given to me by my parents and means foreigner. This concept of foreigner reflects the importance of my connection with people of other cultures while also honoring my own lineage. My middle name Helynn signifies my responsibility and privilege as a light carrier. Heard is my husband’s family name and is meaningful to me as a reminder to listen well to myself and others. Lomi lomi is a way of life which begins for me with choosing again each day to live in right relationship with Spirit, with nature and with humanity and especially to be in right relationship within my own body, mind and spirit. I regularly meditate, dance hula, attend Pilates classes and practice somatic movement exploration for my own well being, as well as in preparation for my work as a massage therapist and teacher. I began doing massage as a teenager in the 1970’s. I graduated from Brian Utting School of Massage in Seattle, WA in 1996 and since then have maintained an active private practice in Seattle called Awareness Massage. I started learning lomilomi in 1996 at the tail end of massage school and have continued to to learn and practice lomilomi every since. An important - and fun - aspect of my lomi lomi training is creating native Hawaiian crafts such as the clothing and adornments I am wearing in the hula photo below. Working with natural materials to create things has helped me be aware of my connection with nature, and my place in the lineage of humanity and my responsibly to hold space and maintain connection between those people who came before us, and those who will follow us. And creating beautiful functional objects allows me to play with art; I've been an active artist since childhood. I love teaching people highly effective, clinical thinking and hands-on techniques which are spiritually grounded in the foundation of Spirit-Nature-Humanity. In my teaching I emphasize body awareness, use of one’s weight, development of keen palpation skills and the use of the creative power of the words. My intent as a teacher is to see the Light in each person and to help each student to be and to do their very best. I help students develop a quality of touch which is deep yet gentle, and also to integrate spiritual and/or emotional qualities into bodywork sessions if so desired to support healing on multiple levels. 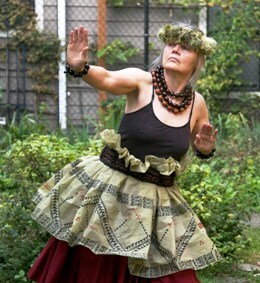 In addition to my passion for practicing and teaching lomilomi, I love to dance hula. Hula is my joy! danced hula at Halau Hula o Napualani and Na Lei o Manu'akepa since 2000 for 17 years. I love the Hawaiian language, and I avidly read books and articles about Hawaiian language, history, culture and spirituality. I enjoy networking with other lomilomi folks from various lineages. 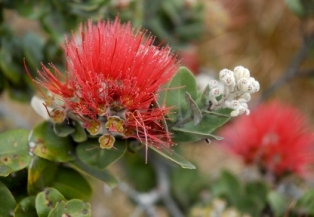 This is a lehua blossom which grows on ohia trees in Hawaii. Ohia trees are one of the first plants to return to an area after a lava flow. The Lehua is related to the sun and to Light, as I am too. Lehua is my Hawaiian name.